Mr. Farooqui is an Electronics Graduate. 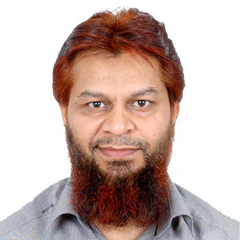 He has 26 Years of Teaching, Research and Development Experience in Remote Sensing & GIS. Before joining College of Petroleum Engineering and Geosciences (CPG) he worked as Remote Sensing and GIS Analyst for 22 Years at King Abdulaziz City for Science and Technology (KACST) Riyadh, Saudi Arabia. His expertise is in Remote Sensing, GIS, 3D Modelling, Laser scanning, Geological and Geophysical Investigations using Ground Penetrating Radars (GPR). At KACST he was involved in many Remote Sensing and GIS projects like Earth Surface distortion mapping due to Sink Holes, Volcanos and Earth Quakes, Oil Spill Mapping, Mineral Mapping in Sabkhas, Archeological site investigations, Soil and Water Contamination Studies due to UST leakage, Environmental, Geological and Hydrological Studies, Coastal and Marine habitat mapping etc. B.Sc. (Electronics), Osmania University, India. Environment and Earth Sciences: Mineral Exploration, Earth Surface distortion and subsidence mapping; Faults, Sinkholes, Geological and Geomorphological mapping; Hydrological Studies, Water and Soil Pollution studies; Desertification and Sabkha Studies; Air quality and Visibility Mapping; Agriculture, Mangrove and Forest Mapping; Landuse, Coastal and Marine studies, Archeological Studies. Paper “Air Pollution Concentration Modeling by GIS in Riyadh” published in 14th Annual International Conference and Exhibition on Geospatial Information Technology Proceedings 2012. Paper “Environmental GIS of Wadi Hanifa” published in 6th Annual ESRI Middle East & Africa User Conference Proceedings 2002. Awarded Arc/Info software in a competition conducted by Environmental System Research Institute (ESRI), USA, for the best map produced in Arc/Info at ESRI users conference 1998. Certificate of Appreciation for Technical Support rendered to Saudi – Japanese Joint Research Project, R4-2 Project Building Landuse and Vegetation Biomass Database using Remote Sensing and GIS. Received Certificate of Excellence for developing and managing Spatial Data and Numerical Analysis Laboratory at NCET, KACST. Technologies Conference 2014, Riyadh Saudi Arabia. 10th – 12 the November, 2014.